The job of an employment agency is to help job seekers find work – but do employment agencies work? There are 2 different types of agencies out there – privately owned and run, and public – or government run ones and both are there to help you find work. 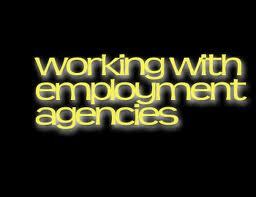 Employment agencies are there to assist people looking for work be it part time, casual, temporary or full time. It depends on the type of work you want and the hours you can do, IE part time work around a university course, or casual work slotted in around a young family, even those looking for full time work take on casual or temp work to get by while still looking for that full time job. Some people love the nature of temp or casual work, a few days here, a few weeks there, it’s a great way to gain experience in other fields, you may even get some free on the job training, which is great to add to a CV, especially if you are a school leaver looking to grow your CV. Employers often need staff on a temporary basis to fill in for sick workers, those on leave or holidays – skills such as book keeping, accounting and secretarial work are often in high demand. Casual work can also be found during short term projects such as trade shows, fairs and special events. Some employment agencies focus on particular skills or industries – such as industrial work, office work or the hospitality industry, so it is important to go to an employment agency that is looking for people with your skills – don’t look for fork lift work at an agency that specialises in hospitality. What agency you chose also comes down to what level of help or assistance you need –if you have a disability or special need. Some agencies only help those with a disability find work and they work with employers who are *disability friendly* and can also help negotiate between the employer and the client to match the right job seeker with the right job. It can be beneficial to sign up with more than one employment agency as different employers use different agencies, this way you are increasing your chances of finding work, signing with one agency alone limits your chances and if casual or temp work is what you’re looking for you’ll find with your CV spread over several agencies more work will head your way. For the person looking for a work – job hunting can be a full time job in itself but thanks to employment agencies they put you in touch with the employer and this can help make the process shorter and matches the candidate with the job better. Sometimes casual or full time placements lead to a permanent job after a trial period as well. Job agencies are great to match you to a job and should never be overlooked.